Our standard models of 5S Cleaning Stations are typically 1850mm high x 1000mm wide and are suitable to be wall-mounted inside or outside. Our designs and layout are digitally printed and then laminated onto a variety of substrates including Aluminium board, Foamex, Parlight and mdf. All fixings for attaching your items to the boards are included. 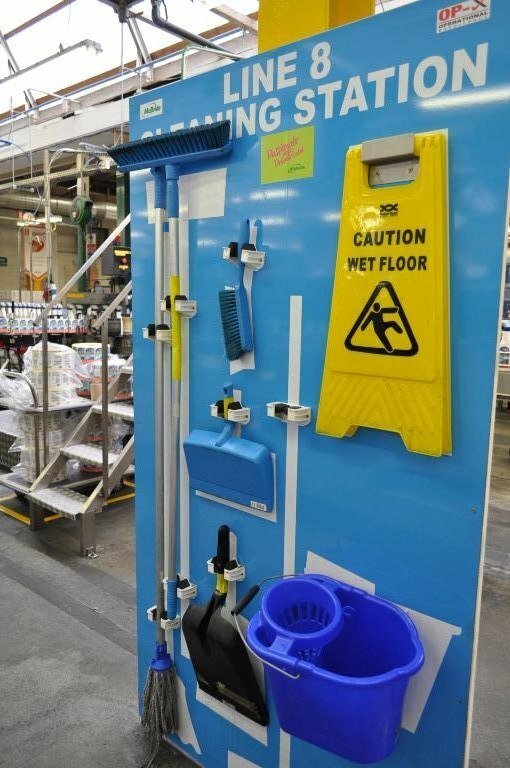 We can supply colour coded accessories (e.g mops, buckets etc) too. Please contact us for more details (info@national-engravers.co.uk). 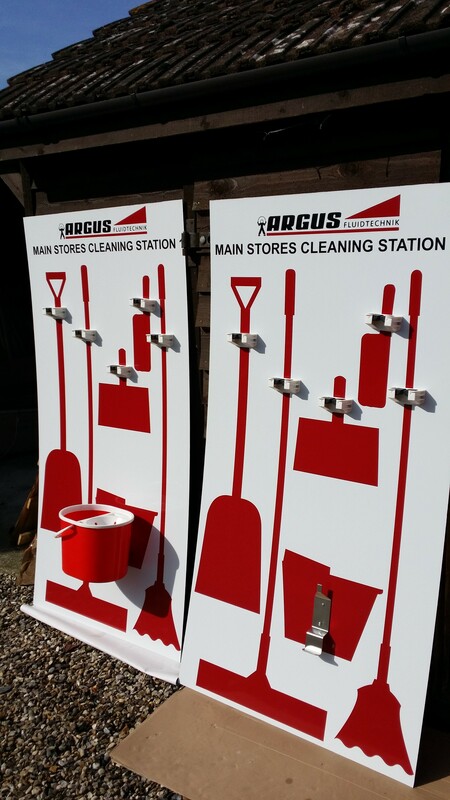 Boards are also available in a free standing version or on a mobile unit. PLEASE NOTE: The £195.00 price is for our standard wall mounted station only. Please Call 01233 840999 for a quotation on specific requirements. All our boards are bespoke. 5S shadow boards are an excellent way to keep your shop floor or work-shop in order. UV printing on vinyl or direct on to a board-any shape or colour of your preference. Laminated for EXTRA protection especially crucial in the food industry. It can be applied on 3mm ALUMINIUM COMPOSITE, 18mm MELAMINE, PVC or CLEAR ACRYLIC. Wall mounted or fixed to a movable frame. All componants including brushes, dust pans, mops & buckets can be supplied too. All made with high quality products for durability and scratch resistance. Our professional Lean Advisors are here to help you generate "lean" thinking into your organisation. We supply a full service from conception through to implementation and training. Lean principles are essential in today’s business world promoting standardisation procedures, which eliminate the waste of manufacturing resources, time, manpower, space and many other aspects within an organisation. Kaizen is a Japanese word meaning gradual and orderly, continuous improvement. It is a business strategy that involves everyone in an organisation making sustained continuous improvement, without large capital investments, focusing on eliminating waste in all systems and processes of an organisation. Uses small continuous improvements to establish and maintain improvements. Excellent products and great communication throughout the project. Will use again. National Engravers were submitted a challenge with our remit but delivered beautiful looking mobile cleaning stations that look so strong we might be having them around for decades! !